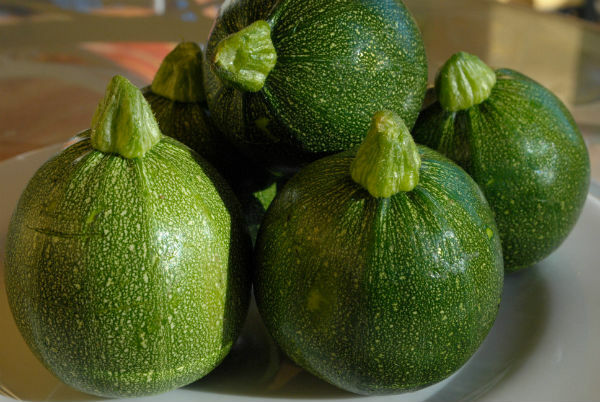 Last week on my weekly trip to the Santa Monica Farmers Market, I spied these cute little zucchini balls. I could not leave them behind. Did I ever mention that I am the proud owner of one of those little old Nona or Bubby carts. I filled it up to the brim, zucchini balls, carrots, beets, cauliflower, fresh berries, kale, parsley and on and on. I like to get to the market at 8:30 right when it opens. The fog was lingering while the sun was trying to burn through, the air a bit chilly, and the bustling energy of this bright colored place is ever uplifting. I was lucky enough to have leftover rice in the refrigerator. It was Lundberg Brown and Wild Blend, cooked with sautéed onions a bit of lentils and a few pistachios thrown in for good measure. Heat saute’ pan on medium, add oil, add onions, and cook until beginning to caramelize. Season onions with salt, add rice. 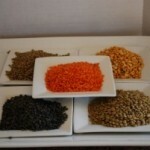 Stir rice for a moment, add lentils and then, add water. 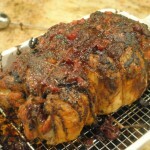 bring to a boil, cover and let steam on very low heat for 40 minutes or until all water is absorbed. Wash and dry zucchini. If using flowers, clean them as well. Slice off stem end to be a cap. 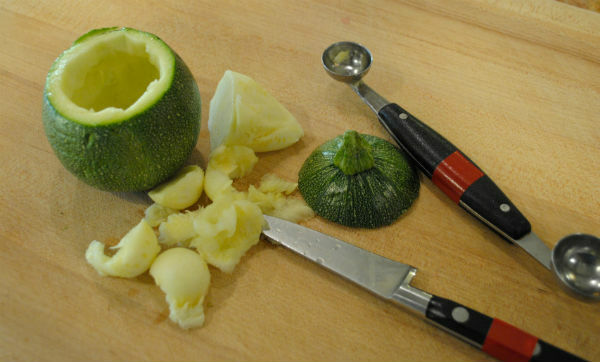 Using a melon ball scoop or a small spoon hollow out zucchini, leaving a shell at least one quarter inch thick. 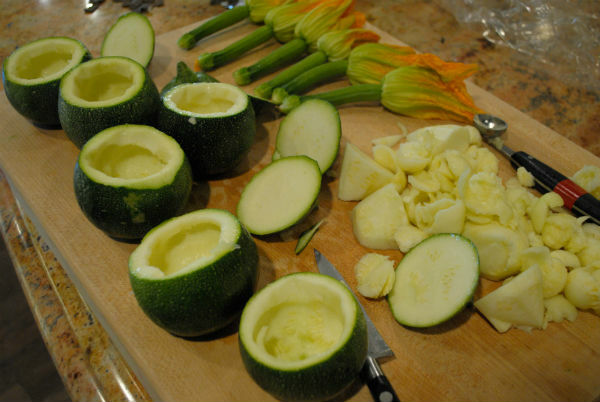 Reserve zucchini insides. 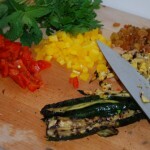 Using a pastry brush or a small silicone brush, brush hollowed out zucchini with olive oil. 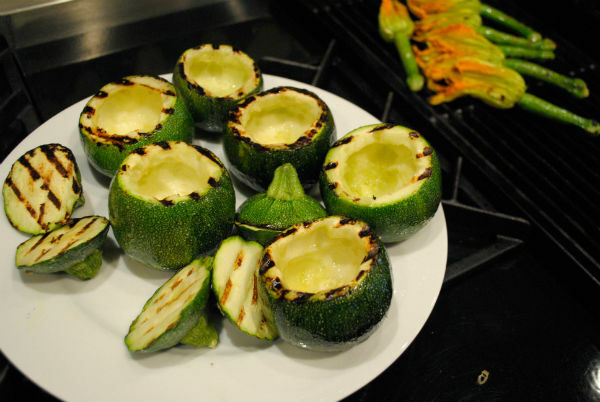 Preheat indoor grill or broiler and on high and gently grill zucchini to give a little color and some flavor. 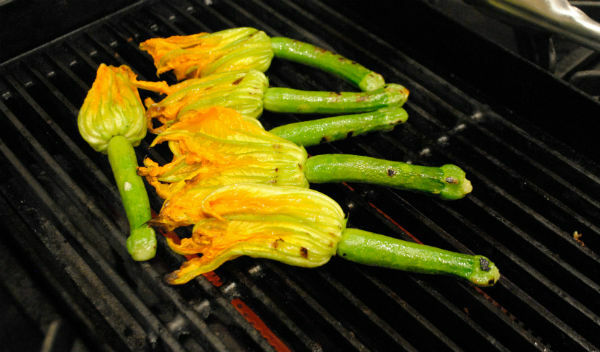 Grill zucchini flowers, optional. Mix chopped apricots with cooked rice. Gently spoon rice into zucchini. Dice zucchini insides. Pour a couple teaspoons of olive oil into a baking dish that will accommodate all zucchini. Spread zucchini insides over bottom of baking dish. Layer chopped tomatoes over bottom of baking dish. Season all with salt and freshly cracked pepper. 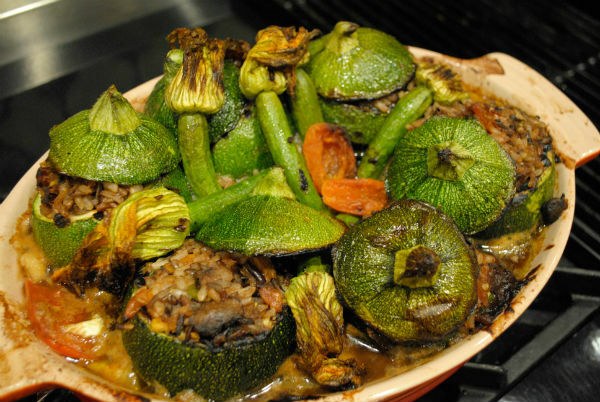 Heat oven to 350° F. Place filled zucchini in baking dish over tomatoes. 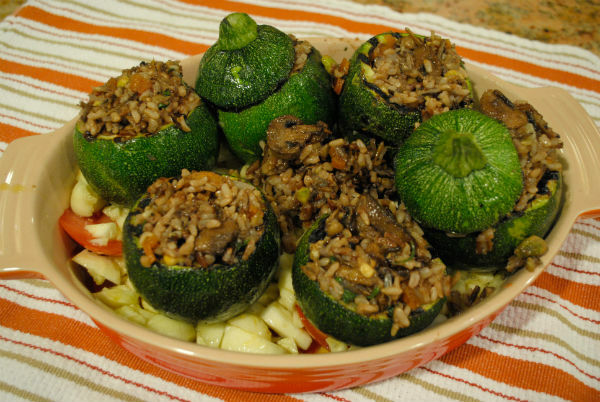 Mix tamarind paste with water and pour around stuffed zucchini. 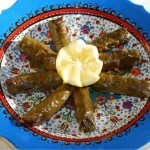 Cover zucchini with a sheet of aluminum foil. Place baking dish hot oven. Bake for one half hour covered, then uncover and bake another one half hour or until browned and bubbly. Serve hot or cold. 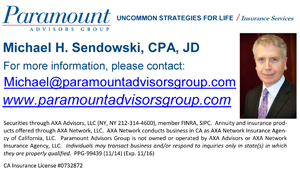 This recipe can be easily increased or decreased. 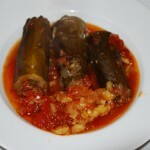 This recipe makes a great vegetarian main course.